With Vanity URL people can get a custom URL to their personal or business profiles and use a direct simple link which is easy to remember and instantly connects to main Google profile page. Google recently started rolling out their Vanity URL scope for most of the average users. If you get one, most probably you were lucky at the instant. (Many suggest one need 10 or more followers, profile photo and at least 30 days old account for getting custom for personal account). Moreover, who would not like to have their own custom business Link on Google profile? Mostly it is an only option to get back to particular Google profile page is to bookmark it. It is impossible to remember a long string of codes and numbers which connect to profile pages. To compete with Facebook's custom profile URL's possibilities, Google took this initiation quite back in 2011, but soon later they started rolling out this for general users. Facebook providing Vanity URLS to their all users from the start of their social online service. Then it is a question why Google couldn't? Maybe a patent issue or something else. While Facebook asks you to create your own Vanity URL, Google in reverse suggests among available URL options to choose. That's quite ok.
Another solution is using Google Pages. If you want to marketise your local business you can avail Google Plus Local Service to verify your business. 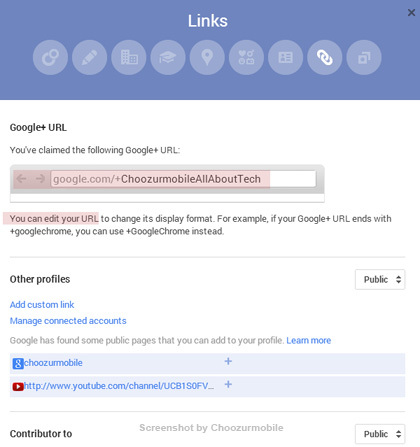 Go to About tab > Under Links > Google+ URL, Click Get URL. Select the best option as per requirements; confirm the terms and Click Change URL. Google will ask you for mobile verification to enter a code sent through SMS. You can further edit your Custom URL by going to it in the same way. Click Edit at the bottom of a section.